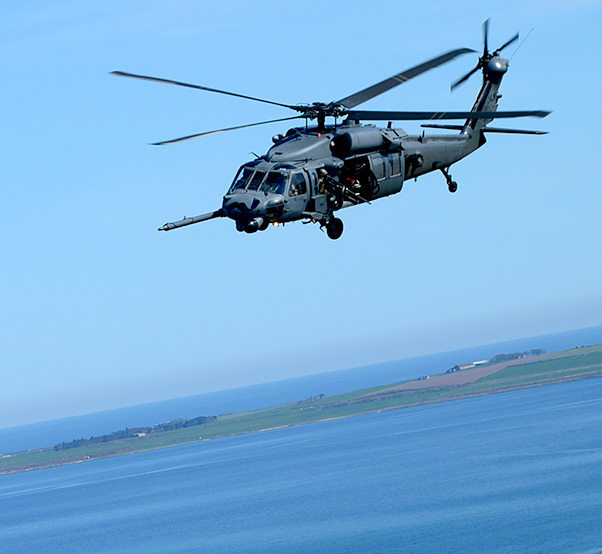 An HH-60G Pave Hawk assigned to Royal Air Force Lakenheath’s 56th Rescue Squadron flies over Scotland during exercise Joint Warrior 15-1, April 22, 2015. The Air Force announced Nov. 6 that the 56th and 57th Rescue squadrons from RAF Lakenheath are relocating to Aviano Air Base, Italy, starting in fiscal year 2017. The 56th and 57th Rescue squadrons from Royal Air Force Lakenheath, United Kingdom, are relocating to Aviano Air Base, Italy, starting in fiscal year 2017, Air Force leaders announced Nov. 6. About 350 personnel, five HH-60 Pave Hawk helicopters and Guardian Angel weapons systems are expected to relocate in an effort to establish an enduring personnel recovery location within Europe. The move is expected to take two to three years to complete. During the European Infrastructure Consolidation review, programmers found excess capacity at Aviano. Part of the additional space was designated for the 56th and 57th Rescue squadrons, which deploy around the world to recover personnel from difficult and hostile conditions. Construction decisions and transition milestones for the relocation will take place over the next several years.